Near the Overton County/Pickett County line going toward an area of Dale Hollow lake known as Keisling Bottom, a small white school building still stands. That school, which has also served as a church, is officially known as Plain Grove, but most folks around that area know it as Possum Trot. Not too far from the school building, two homes were located, and on October 17, 1936, a baby boy was born to Lester V. Winningham and wife Ruby (Maxfield) Winningham, a young couple who made their home in the smaller of the two houses located there. Lester’s parents, Anderson and Kitty (Ledbetter) Winningham, lived in the other home. The baby was given the name Hosea. At the time Hosea was born, he had one older sister, Phoenicia. Hosea’s life growing up in the country was much like those of everyone who grew up then. He had lots of responsibilities as a growing boy that included keeping firewood chopped that was used for heating their home in the winter, and for meals that were all prepared on the wood cook stove. Like most in rural areas, their home had no electricity until the early 1950's. His family raised a big garden every year. They always kept a milk cow, and there were chickens and hogs too. Hosea stands in front of the house where he grew up at Possum Trot. Hosea’s family did have one thing that was not too common for folks who lived out in the country during the time he grew up, and that was a car. 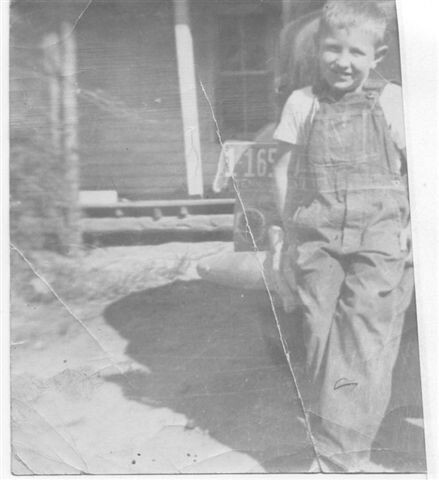 Hosea’s father, Lester Winningham, worked in Byrdstown as a mechanic for Lloyd Sells who owned a Chevrolet dealership. Each working day, Lester traveled back and forth to Byrdstown, which was a much shorter trip then due to the fact that there was a bridge across Eagle Creek connecting the Plain Grove, Hatcher Hall, and Taylor's Crossroads communities to the Midway Community. Hosea remembers very well the day the bridge across Eagle Creek collapsed. After Dale Hollow dam was completed and the land the lake covered was flooded, the waters of the lake rose high enough to wash the bridge away. He and his father were probably the last ones to drive cross the bridge, even though there were people on the other side of the bridge telling Lester not to cross, that it wasn’t safe. He went ahead anyway, and just ten minutes after they made it safely across, the bridge collapsed and was washed away. Hosea didn’t have too far to walk to attend school at Possum Trot, the two roomed school he attended for eight years. He remembers Artis Winningham being one of the teachers there. Artis taught the fifth through the eighth grade, and Artis’ wife taught the first through the fourth grades. Possum Trot had a softball team, and Artis would cram the entire team into the car he drove and take them different places to play ball. After the death of Kitty Winningham, Lester moved his family into the home Kitty and Anderson shared. Anderson was known to all his grandchildren as Pappy. As time went on, in addition to Phoenicia and Hosea, Lester and Ruby’s family grew to include two sets of twins, Richard and Rogers, and Clester and Lester. The smaller home the Winningham family moved out of later became a place where used clothing could be bought through a program known as Save The Children Foundation. Hosea’s mother, Ruby, was in charge of selling the items of clothing that were brought in by large bundles. Families for miles around looked forward to trips to Ruby’s to browse through the piles of used clothing and shoes that were sold for a nickel or a dime per item. In 1948, Lester Winningham built a service station in Livingston, the same building that Johnny Savage owned until his death not too many years ago located at the intersection of East Main and Broad Streets. The business was known as Gulf Pride Service Station. After Hosea started high school at Livingston Academy, he would ride into town with his father each morning. Their day began around 4:00 a.m. each day with the drive into Livingston to begin the working day at the service station. After opening the station each morning, Hosea helped his dad until time for school to begin. After school, he returned to the station and worked until closing time which was around 10:00 p.m. each night. In between pumping gas or whatever job his dad needed him to do, he managed to find time to study and do homework. Hosea went out for football his freshman year. Livingston Academy had a very good team his senior year. They lost only one game during the regular season, and that was to Sparta. Their team went on that year to play in the Tobacco Bowl held in Hartsville, Tennessee. Cordell McDonald and Elmo Swallows served as coaches and saw their team receive the championship of the bowl game with a score of 12 to 13. 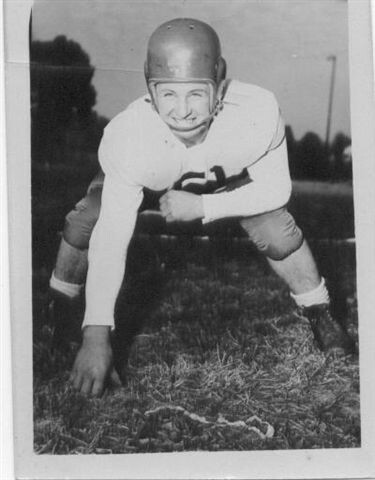 Hosea was a member of the Livingston Academy football team the year they won the Tobacco Bowl in Hartsville, TN. The Winningham family left Possum Trot in the early 50's, and moved to Livingston. Following high school graduation, Hosea attended Tennessee Tech for three years majoring in industrial technology. His natural abilities made him an outstanding student in math, something he has always excelled in. He received the math award in his 1955 graduating class at Livingston Academy. In 1958, he began a long career with Freeman Apple Oil Company that started out with a pick and shovel used to dig out for placement of gas tanks in the ground. He later moved on up to driving a truck delivering gas and oil, and then went on to working in the office. The next twenty years were spent as an employee of Apple Oil. In 1967, Ann Smith, daughter of Otley and Ethel (Norris) Smith, became the young bride of Hosea Winningham. Two daughters were later added to their family, Angela and Amy. During the term Dr. Charles N. Eley served as mayor of the Town of Livingston, Mayor Eley, along with Livingston businessman A.B. Qualls, came to see Hosea on four separate occasions to try and persuade him to run for city councilman. Eventually their persistence paid off, and Hosea agreed to give it a try. That was beginning of a total of 36 years of service to the Town of Livingston. He ran for city councilman five times, and served as Vice-Mayor for four years during the period of time he was a councilman. In 1978, ironically it was then councilman Frank Martin (present Mayor of Livingston) who persuaded Hosea to run for Mayor. For the next 13 elections held for the Mayor’s race, Hosea’s name appeared on the ballot, and in all but two of those elections, he was opposed for the position, but always came out as the winner. As Mayor, Hosea’s day began long before daylight. He usually left his home around 4:00 a.m. each morning, and was behind his desk at city hall by 5:00 a.m. After spending an hour or so in the office, he proceeded around 6:30 a.m. to the building on West Main known as the shop, and was back at city hall sometime before 7:00 a.m. to get the day in the office rolling. It was nothing unusual for Hosea to get up in the wee hours of the morning to check on how things were going at the police department. During the days John Tom Poindexter served as chief of police, Hosea could often be found riding along with John Tom while on police patrol. Most often if there was a problem with a broken water line somewhere in town, it was Hosea’s telephone that rang first. He could often be found down in a ditch alongside of water department employees. A lot of growth has been experienced by the Town of Livingston under Mayor Winningham’s leadership. And in my opinion, one of the most beneficial things that has happened was expanding the water system to the rural areas of the county. Only those of us who have experienced what it’s like to not have abundant water in our homes can truly appreciate what this means. Industrial growth has been experienced during Mayor Winningham’s term with the addition of Precision Rubber, Aeroquip, Advanced Plastics, Hutchinson’s, Just on Time Packaging, and American Mantle. With grant money, the present city hall building was constructed. Some of the services provided to citizens include sanitation pick up, bush hogging of lots, pick up of leaves in the fall, mosquito spraying service, and chipping service for brush and trees. Construction of new sidewalks, paving of streets, expanded water service, improvements to the airport, purchase of new fire trucks, building of the public safety building, and new lighting of bypass are just some of the accomplishments that have come about during Mayor Winningham’s years served. Included in the 36 years of service as councilman and later Mayor, Hosea has served with the Upper Cumberland Human Resources Agency and also the Upper Cumberland Development District., an agency with which he has held several positions including Vice Chairman, Treasurer, Secretary, Budget Committee Chairman, and as a member of Personnel/Grievance Committee. Wendy Askins, UCDD Executive Director, had this to say about Hosea: "Mayor Winningham has always been supportive and committed to our programs at UCDD. We are certainly going to miss him as an integral part of our UCDD team. We wish him much happiness in his retirement." You’ve come a long way, Mayor Winningham, from days growing up at Possum Trot to 36 years of service to the citizens of the Town of Livingston. No other mayor or alderman in the history of the Livingston has held office that many years. One of his strongest opinions about managing either a household or running a town is to avoid being in debt if at all possible. And if being in debt does occur, work hard to find a way to get the debt paid off as quickly as possible. That’s good advice that can apply to any situation. Some of the things Hosea told me he is already missing since leaving his position as Mayor are seeing the employees he worked with on a daily basis, and most of the general public he came in contact with while serving as mayor, especially the older citizens of Livingston. One of the thing he especially tried his best to do was to accommodate older folks who came to him in need of help with problems that related to city government. Retirement for Hosea will probably take some getting used to, but with the news he and Ann recently got about their first grand baby on the way, life will be different for them after February of next year. Their daughter, Angela, and her husband Tim Young, are expecting their first child. It won’t be surprising to pass the new baby’s grandparents’ home sometime in the next year or two and see a tricycle, or other children’s toys, in their driveway. And no doubt whatever toy might be seen there will be sparkling clean if Grandpa and Grandma Winningham have anything to do with it. Their home and the vehicles they have always maintain a very well cared for appearance, another good trait they both have. Anything worth having is worth taking care of is definitely a standard they believe in. Thank you Ann and Hosea for letting me share bits and pieces of what I would consider to be some very dedicated years of service that the citizens of Livingston and Overton County as well have greatly benefited from.